Z War One - Exodus is a standalone game for 1-5 players that combines intense tactical combat, resource management and an engaging comic book narrative. The Kickstarter edition of the game comes jam packed with four different game modes, including 2 separate comic book campaigns & two difficulty settings. Ultra high quality components, plastic coated cards & finely detailed miniatures make this the ultimate survival horror experience! The highly detailed Exodus miniatures are available in both resin & metal. 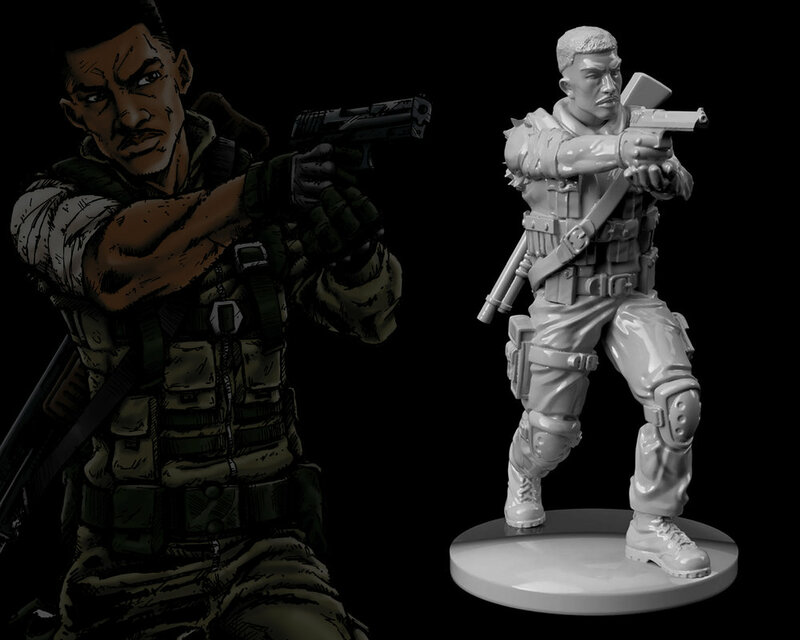 The Exodus comic book campaign, which can be played either solo, or 2 player co-operative, sees players taking on the roles of two war veterans, stranded on an island ravaged by a rapidly mutating super virus. Their perilous journey will take them from infested towns and harbors, to the claustrophobic corridors of an abandoned cargo ship and even out onto the open water, where untold horrors lurk. Comic book "cut scenes" link the increasingly challenging missions for an immersive and breathtakingly cinematic experience. Players work to complete story-centric objectives across a variety of locations, while constantly scouring the environment for resources. Inventory rolls over from one mission to the next, so players will need to search rooms & crates to find ammunition, equipment & an assortment of everyday items which can be crafted into tools imperative to future survival. The "pregame lobby" feature allows players to level up their heroes between missions, choosing from a wide array of available "perks". They may also freely craft items, reload weapons and assign equipment. At this point, players also have the option to "save" the game, but choose your save point wisely, as there are just 3 available save tickets for the 7 chapter campaign. All of the Exodus comic book campaign missions can be played as stand alone "quick play" missions, simply choose perks, set up the game & play. Additionally, for larger groups, there are "party play" missions, with bigger maps & difficulty scaled for up to 4 players. The 2-5 player Director Mode is a game variation which allows an extra player to take on the roll of "the director". Through the use of director cards, this player can stack the odds against the heroes, manipulating spawning, pacing & enemy behaviour to suit their own evil design. A director can even be added to the campaign, but only if you're feeling brave! Climb aboard the rib and head out into the open water for a terrifying tussle with the aquatic Reavers. Descend into the bowels of the cargo ship where danger lurks around every corner. The Kickstarter edition of Exodus comes complete with the intense & emotionally charged "Dark Tide" expansion. Experience the terror of the initial outbreak from the perspective of two desperate parents, fighting to get their daughter to safety. This prequel campaign introduces new characters, locations & monsters to the Exodus roster! The battle hardened captain of RAC Team Alpha-20, Kira is no stranger to combat against the infected, having spent the last two months leading missions over the wall into the infested south. Her last ill fated mission, Operation Breakwater, left her team dead and her stranded. Captain Chase has just one objective: get back in the fight! Warrant Officer Mike West is most at home a few thousand feet above the battlefield, current circumstances however leave him no choice other than getting up close and personal. It's a good job then, that Mike is a more than capable warrior. Who needs 5 tonnes of combat chopper anyway when you have a steel pipe with some scissors taped to it? Alone and afraid in a world full of monsters, this kid will need to grow up fast if she's going to make it out alive. A woman possessed, Becca's family are in danger & she'll stop at nothing to get them out. No price is too high, no sacrifice too severe. They WILL reach sanctuary & she will let nothing, human, infected or otherwise stand in her way. Becca is part of the Dark Tide expansion set. A man prepared to go to any lengths for the ones he loves, he's seen the news, he knows what they're up against. He has a tough, capable wife by his side, a young daughter to protect & most importantly... he has a plan. Joe is part of the Dark Tide expansion set. The rank and file undead, slow moving and easily dispatched (providing you have the bullets), these shambling unfortunates rely on either surprise or sheer weight of numbers to bring down their prey. Tough on land, terrifying in the water, Reavers use a crafty "dive" mechanic to avoid taking damage during their approach. When it comes to dealing with these amphibious nightmares, you're going to need a damn sight more than "a bigger boat". These freshly infected souls are faster & more dangerous than their decaying older relatives. With a spring in their step and a hunger for flesh, newborns will give any would-be hero a "run" for their money. The beautiful *cough* ladies of the deep, these regenerating behemoths can absorb an ungodly amount of punishment so keep your distance, or risk joining the ranks of their semi-digested slaves! The Siren's grotesque offspring, these nimble infected hunt down unsuspecting humans using their finely tuned sense of smell, dragging them kicking and screaming back to mother's gaping maw! They say variety is the spice of death and never has this been truer than in the case of the "all star roamers". This motley bunch are an optional feature for Exodus players wishing to bring a little more personality to the undead masses. Pulled from a finite spawn deck, the all stars each have personal traits & stat cards making roamer encounters much more unpredictable and potentially deadly!